Switching over to our water-cooling loop decreases load temperature deltas by up to 35 degrees Celsius on this sample (as reported by on-die DTS). 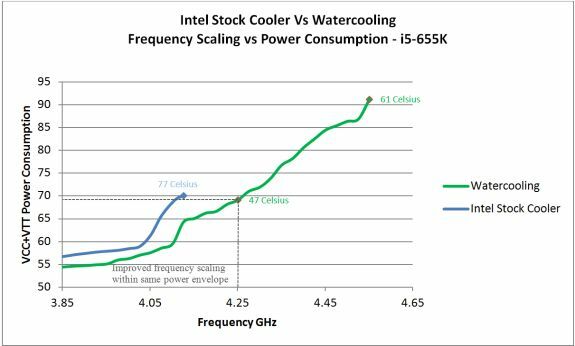 The upshot of this is seen quite clearly in the graph - lower load temperatures decrease processor power consumption at equivalent frequencies due to a positive temperature co-efficient (the hotter the CPU runs the more power it leaks - all else being equal). With the end result being that we’re able to boost our previous 3.77GHz stock VID overclock using the stock Intel cooler by almost 200MHz to 3.953GHz. The improved thermal dissipation allows us to ramp voltages and takes us all the way to 4.55GHz before we hit the wall of diminishing returns. The demands on voltage ramping past this point are such that we start to see a minimum 5~10 watt rise in power consumption for every 20MHz increase in frequency. Also note, that we’re about 40MHz away from doubling up on stock processor power consumption; 4.25GHz seems to be the sensible operating point, coming in at 16 Watts over stock power draw to VCC and VTT with a 900MHz boost in full-load core frequency - and that’s with all performance related domains overclocked. "it’s full of talk about voltages and harps on about overclocking"
Guys, i think you should not hurry to release articles instead of taking them slow and sure. Many typos especially in the graphs.